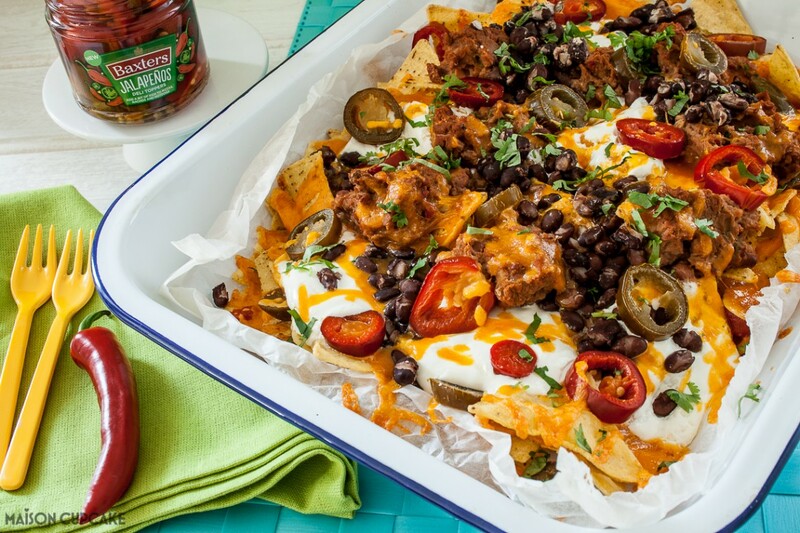 This spicy black bean nachos recipe was commissioned by Baxters’ Deli Toppers. Find out more below. I know for a fact when I was 9 years old I would not have known what nachos are. For I remember my first ever shared plate of nachos was – don’t laugh – in a branch of Wetherspoons in Soho during my student days. Bear in mind this was before British pubs had mostly shut down or gone gastro. A giant platter of nachos was the thing to order if you found yourself hungry in a pub but didn’t quite have the motivation to leave. Nachos are a fun social food to eat with friends. They go very nicely with a cold Mexican beer during this Indian summer we are enjoying right now. 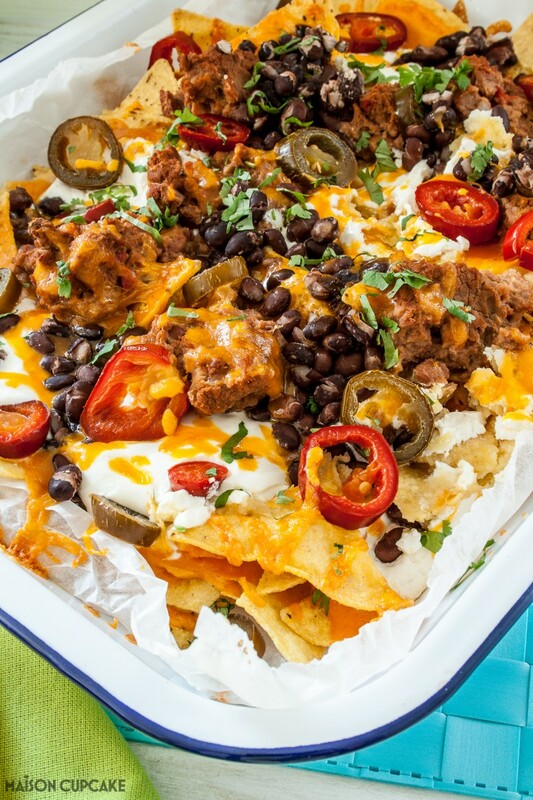 The greatest challenge when sharing a platter of nachos is who is going to get The King Nacho. The King Nacho is the piece that when you pick it up has more topping on it than any other so far. This must be The King Nacho. No – surely THIS must be The King Nacho. Please please let me get The King Nacho with stretchy cheese and overloaded topping. Before today I had never entertained the idea of making them myself at home. But goodness me I shall do so again. Here’s how to build up your tray of nachos… they’re really easy and you can whip them up from start to finish in little over fifteen minutes. First in a nice big flat container or tray, arrange a layer of tortilla chips with grated cheese. Next add more tortilla chips. On top of that yet more cheese and dollop generous spoonfuls of soured cream and refried beans. Then fill in the gaps with pools of black beans. Finally dot with plenty of jalapeno pickles – today we are using ones by Baxters Deli Toppers. Bake in the oven at 180c / gas 4 for around 7-8 minutes until everything has warmed through and the cheese has melted. Dig in and enjoy immediately! These jalapenos are one of collection of new Baxters Deli Toppers products. Each one is vegan and vegetarian friendly; jalapenos, red onion, spicy slaw and red slaw. The new range is inspired by the foodie and fashionable street food scene. At recommended price £1.49 these perky pickles will be a convenient affordable way to add a finishing touch to hot dogs, burgers and other street food style dishes at home. 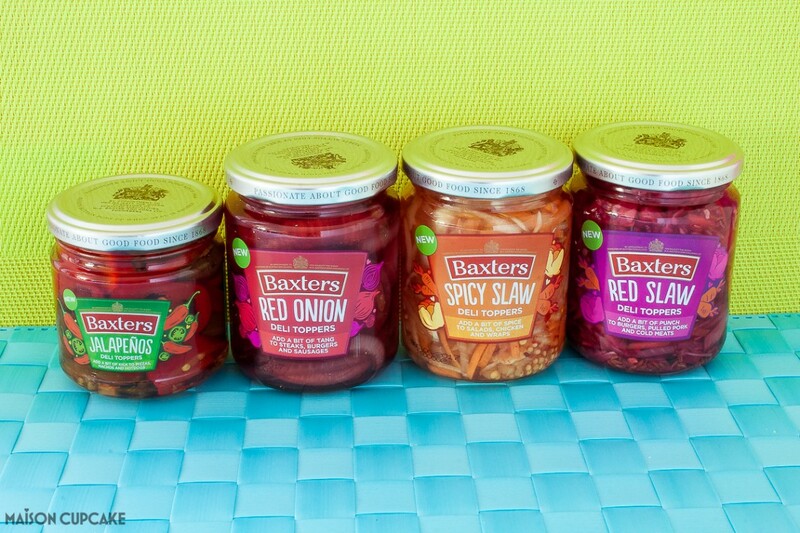 Baxters are also giving some jars away on their Deli Toppers website. I will be creating a recipe weekly with each of the new varieties in the range and can’t wait to share these with you. Fingers crossed this Indian summer will continue and we can enjoy them in the garden with a cold drink! 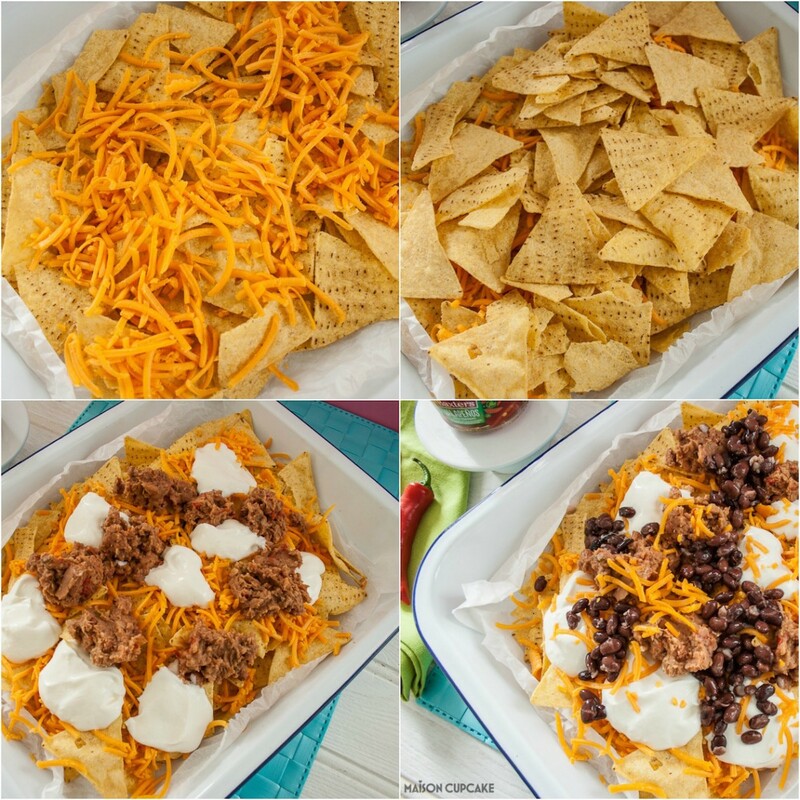 Have you ever made your own nachos? A sharing platter of nachos is fun to eat with friends. This version topped with Baxters Deli Toppers jalapeno peppers and black beans. Preheat the oven to 180c / gas 4. Line a large flat tin or oven proof tray with parchment paper. Lay ⅔ of the tortillas on the surface and scatter with half of the cheese. Top with the remaining tortillas and most of the remaining cheese. Spoon over dollops of soured cream and refried beans. (It is easier to spoon the refried beans if they're preheated). Spoon pools of black beans into the biggest gaps. Finally scatter over the drained jalapeno Deli Toppers and the last of the cheese. Heat in the oven for 7-8 minutes until warmed through and the cheese has melted. Serve immediately. 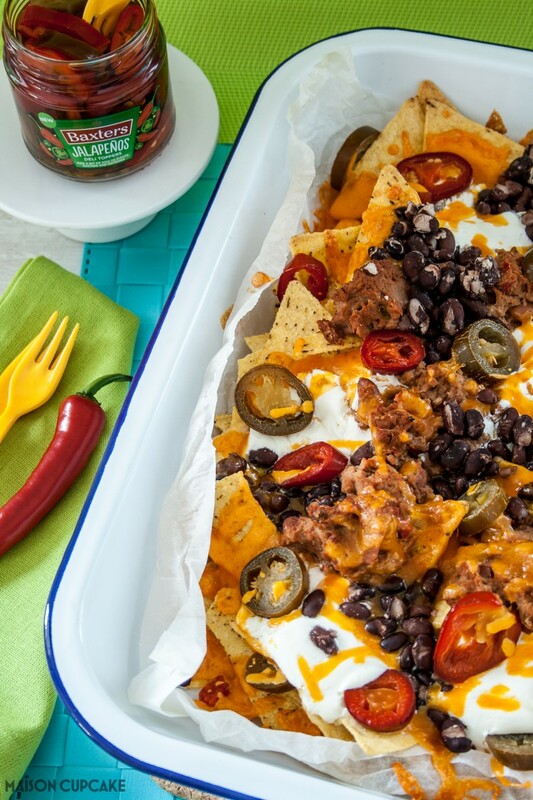 This spicy black bean nachos recipe post was commissioned by Baxters to showcase their new Deli Toppers range and #GetTopping campaign. Find out more about Baxters Deli Toppers online. 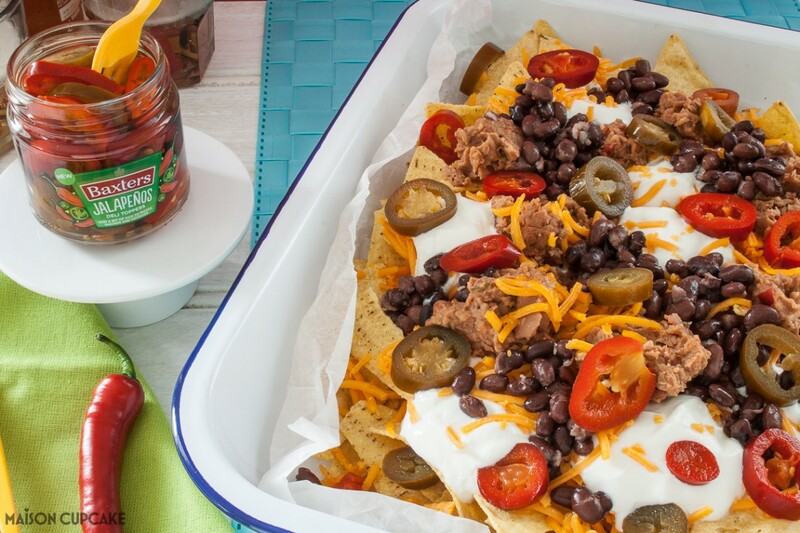 These look SO good – I’ve been craving nachos this week. Bookmarked! They are SO more-ish and yes I get the red slaw would be tasty on them too. I’ve never heard of King Nacho before, but I could see people getting competitive, well in this household at least. I’ve not made nachos for years and they never looked as good as this. Loving the Deli Toppers, really handy to keep in the cupboard. So many uses. The best King Nacho is when it drags half the plate with it and you have to tear the cheese!!!!! I was a student too the first time I had nachos. I have been unable to resist them ever since. We make them regularly at home, but I’ve never made them with jalapeños as I have no idea where to get them – now I know! Jalapenos in vinegar are so useful, I have also used them in lentil dahl when no other fresh chilli to hand. Yum, I LOVE nachos and these look incredibly good. Love the idea of the ‘king’ nacho! Must try these jalapeños,they look gorgeous. Thank you Kate and I hope you get the King Nacho next time you enjoy nachos!! This looks absolutely scrummy!! I’ve never seen red and green jarred jalapenos before, I shall have to keep my eyes out for them!